According to two Ecumenical Councils—Trent and Vatican I—the unanimous agreement of the Fathers on any interpretation of Scripture concerning a doctrine of faith and morals is authoritative for Catholics. And the Fathers were unanimous in holding that Genesis 1-11 is a sacred history and that the events contained in that history happened as written. The Roman Catechism—the only Catechism mandated by a sitting Ecumenical Council—calls Genesis a “sacred history.” The Pontifical Biblical Commission decrees of 1909 require Catholics, under pain of serious sin, to believe in the historical truth of the contents of Genesis 1-3. The last authoritative Magisterial document focused on evolution and the origins controversy, Humani generis (1950), upholds the historicity of Genesis. Nothing in the 1994 Catechism contests this view. Thus, Fr. Guinan’s dismissal of faith in the historical truth of the “stories in Genesis” as Protestant creationism is extremely misleading and grossly unjust. The sad truth is that the portrayal of man’s early history at the Answers in Genesis Museum is much closer to the universal teaching of all of the Fathers and Doctors of the Church than what is taught in many Catholic seminaries, universities and high schools in the United States today. Fr. Guinan goes on to portray the conflict between faith in the historical truth of Genesis and faith in evolution as a clash between antiquated religious beliefs and modern science. He cites Judge Jones’ decision in the Dover case, excluding intelligent design from the public schools as an establishment of religion, and observes approvingly that Judge Jones exposed “intelligent design” as “creationism in disguise.” Thus, the reader finds a Catholic priest sympathizing with Judge Jones’ characterization of intelligent design as “religion masquerading as science” when no less an authority on the philosophy of science than Karl Popper has called macro-evolutionary theory an unfalsifiable “metaphysical research programme.” Honest evolutionists admit that evolution is a religious belief that is used to explain the origins of man and the universe but which cannot ultimately be proved or disproved by empirical evidence. Even the new, improved versions of evolution that are being taught to our children claim that the jumps from one kind of organism to another happened rapidly but admit that no such jumps have ever been observed. But Fr. Guinan is strangely silent on this point. Fr. Guinan defines “creationism” as the view that the world is “only 6,000 and 10,000 years old, and that plant, animal and human species were created pretty much as we know them today.” But this is something of a straw man. The traditional doctrine of Creation holds that God created the different kinds of creatures in the beginning. 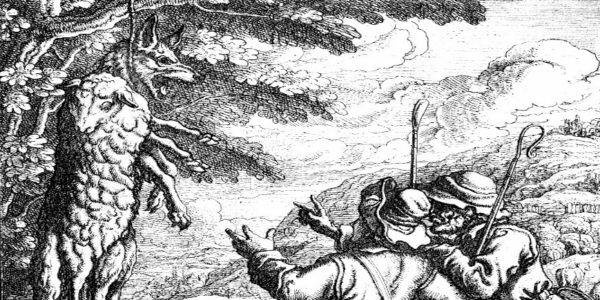 According to this view, for example, all extant varieties of dogs and wolves are the descendants of the original dog-wolf prototype that God created in the beginning. This is far more consistent with 21st century genetics than the evolutionist notion that dogs and wolves evolved from a common ancestor with a totally different body plan. The traditional Catholic doctrine of creation agrees with 21st century genetics that real-life organisms lose genetic information over time while macro-evolutionary theory holds—against all observations of real-world organisms—that the genetic information for new organs can appear and increase spontaneously under the right conditions. Fr. Guinan portrays the clash between “creationism” and evolution as a clash between antiquated religious beliefs and modern science and cites the Scopes Trial where those supporting the side of faith and Scripture were “made to look silly.” Fr. Guinan does not mention the fact that the main “evidence” put forward to support faith in evolution at that time included such frauds as Piltdown Man and alleged “gill slits” in human embryos. These scandalous facts are not hard to discover. As teacher and author Andrew Bradbury has shown on his website, the actual transcript of the trial does not make those supporting the side of faith and Scripture “look silly.” Rather, it shows that the evolutionists promised “facts” but supplied only “opinions”—virtually every one of which (including the non-existent “gill slits” in human embryos used to justify abortion) has been rejected by modern science. Fr. Guinan asserts approvingly that Inherit the Wind “immortalized” the Scopes Trial. But authentic scholarship has demonstrated that the authors of Wind deliberately distorted the facts. Indeed, how can a fabrication “immortalize” an event, when its account of that event and what actually happened are two entirely different things? Fr. Guinan applauds Judge Jones’ rejection of the textbook Of Pandas and People. But if Fr. Guinan had read Of Pandas and People, he would have been forced to recognize that it does what very few textbooks in the United States even attempt to do—it gets students to examine two different explanations for the same data and asks them to decide which of the two does a better job of explaining the evidence. For example, it contains a unit on homology, the study of bodily organs and systems that exist in a variety of different kinds of organisms. The traditional Catholic doctrine of creation would explain these similarities as the result of the Creator’s use of certain common design elements in a variety of different body plans. The evolutionist explains them as the result of the evolution of all of the different kinds of organisms from a common ancestor. Neither of these interpretations can be proven beyond a reasonable doubt, but both of them can be tested against the evidence. When this is done, the superiority of the traditional Catholic doctrine becomes apparent in the light of cutting edge natural science. For example, evolutionists predicted that organisms with common features, like five-digit extremities, would arrive at them by common embryonic pathways, since each creature supposedly “recapitulated” the stages of its phylogenetic history as an embryo. But cutting edge embryology has discovered that different kinds of organisms arrive at the same end-point through distinctly different embryonic pathways—a finding perfectly consistent with the traditional doctrine but quite at odds with evolutionary predictions. Judge Jones would like to see all public school students indoctrinated in the evolutionist view without having the opportunity to consider the possibility of interpreting the data in a different way. The authors of Of Pandas and People would like students to have the freedom to study the relevant facts under a competent teacher’s guidance and draw their own conclusions. You would think that a Catholic scholar would approve of such a method. After all, the exemplar of Catholic scholarship, the Angelic Doctor, excelled in just this kind of exposition, setting forth his opponents’ view better than his opponents could before showing why a particular answer to a question was better supported by the evidence. Instead, Fr. Guinan approves of using the courts as an evolutionist inquisition which insures that no other interpretations of the facts other than the evolutionist one is even allowed to be mentioned. Pakicetus inachus – 52 myr. The actual fossil forms were described in a 1994 article in the journal Science (JGM Thewissen, ST Hussain, M Arif (1994) “Fossil evidence for the origin of aquatic locomotion in archaeocete whales.” Science 263: 210-212.). A less technical account of these intermediate forms and their importance for understanding cetacean evolution was written by Stephen Jay Gould in Natural History magazine (“Hooking Leviathan By Its Past,” Natural History (April 1994), p. 12). Pandas, in teaching students that such intermediate forms would, indeed, could never be found, compounds its earlier misrepresentations of fossil history with an outright falsehood, a misperception of reality which has no place in authentic scientific education. This particular argument has also long had its philosophical critics. Does it actually “prove” the existence of God, or just show that one’s belief in God is reasonable? How does it account for the brokenness and irrationalities in nature? If there are indications of intelligent design, what about the indications of unintelligent design? By posing these questions in this way, Fr. Guinan reveals the fundamental weakness of his whole approach to the origins controversy. He lets slip that he thinks it is possible to identify the world in its present condition with the world that came forth from God’s hands in the beginning. As we will now show, this is both bad theology and bad philosophy. Worse still, it amounts to a kind of blasphemy against the goodness and wisdom of God! These thinkers flatly contradicted the unanimous teaching of the Church Fathers who held, with St. Paul, that “all God’s works were finished from the foundation of the world” (Hebrews 4:3)—after the creation of Adam and Eve—and that God created all of the different kinds of creatures, including man, by a supernatural divine action. Indeed, all of the Fathers would have concurred with the fourth century “Apostolic Constitutions” that the Sabbath was observed “on account of Him who ceased from His work of creation, but ceased not from His work of providence.” Indeed, St. Peter’s primary point in the third chapter of his second epistle is that creation—like the Second Coming—is a supernatural divine action which “scoffers” will try to reduce to a natural process. Tragically, those who “scoff” at the traditional understanding of Creation and the Flood wittingly or unwittingly weaken expectant faith in the Second Coming of Christ, which has always been one of the hallmarks of a vibrant Catholic community. In the light of 2 Peter 3, traditional Catholic metaphysics holds the key to distinguishing the traditional, patristic doctrine of creation from theistic evolutionism which denies the metaphysical distinction between the order of creation in which God created all things “at once from the beginning” and the order of providence in which we live and which natural science investigates. Armed with this metaphysical insight, none of the Fathers of the Church would have had any difficulty answering the questions Fr. Guinan poses about the existence of “intelligent” and “unintelligent” features in present-day organisms. In the first place, the Fathers would simply have observed that the beautiful design elements in nature reflect the wisdom of God, while the dysfunctional elements—such as deformities caused by birth defects—reflect the effects of man’s sin that has marred but not destroyed the original pristine work of God’s hands. By pointing to “the defective functioning” of some organisms in the order of providence as evidence of “unintelligent design,” Fr. Guinan ignores the teaching of St. Paul as interpreted by all the Fathers that the first created world was radically different from the world in which we live, and that the discordant and irrational elements are a consequence of the Fall—and thus he welcomes and approves the very error that St. Peter warned the Church against almost 2000 years ago. Worse still, the evolutionists whom Fr. Guinan admires make judgments on God’s design of creatures so arrogant that the Fathers of the Church would have cringed in amazement. For example, Dr. Kenneth Miller claims that the human eye has “profound optical imperfections,” and so is proof of “tinkering” and “blind” natural selection. Not only is this nonsense in the view of qualified experts, it betrays breathtaking hubris since it ignores the possibility that the purpose of certain design elements might have eluded our puny intellects. Even the most acute mind is shown to be at a loss as regards the least things in the world, either in the ability to explain it worthily or to render due praise to the Creator, to Whom be all glory, honor, and power forever. It is worth noting that in all of the major court challenges to creationism, Roman Catholic scholars—biblical specialists, theologians and scientists— have been witnesses against creationism and the fundamentalist understanding of intelligent design. It is indeed strange that a Catholic scholar would celebrate Catholic support for court decisions that have insured that millions of Catholic students are taught that homosexuality is normal—because we evolved from subhuman primates which practice homosexual behavior; that abortifacient contraception and “early abortion” are acceptable—because the embryo or fetus is “recapitulating the stages of man’s evolution”; that the world has always operated under the same materialistic laws since the Big Bang—and that thus the notion that man’s sin affected the course of nature is “unscientific” if not downright absurd; that Noah’s Flood if it existed at all was a local Mesopotamian Flood—and that therefore God does not intervene on a global scale; and that God deliberately created a world full of animal birth defects, violence, death, disease, and negative genetic mutations for millions of years prior to the evolution of Adam and Eve—and that, therefore, these disorders are not the consequence of our sin but of God’s free choice. Fr. Guinan goes on to give a short exegesis of creation in the Bible that is radically Protestant in its indifference to patristic or Magisterial teaching. Fr. Guinan not only denies the difference between the creation period and the period of providence, thus contradicting the common teaching of all of the Fathers and Doctors of the Church that the creation of new kinds of creatures ended with Adam and Eve. He also gives the impression that Scripture scholars like himself enjoy a kind of superiority over the Fathers of the Church and that their interpretations without reference to Tradition are more reliable than those of Fathers. But this is false. The Magisterium has upheld the primacy of the Fathers as commentators on Scripture just as it has upheld the historicity of Genesis 1-11. It is ironic that an article devoted to deprecating “Protestant creationist” exegesis of Genesis ends up by adopting a neo-Protestant approach to exegesis. Indeed, Fr. Guinan’s exegesis of Genesis is neo-Protestant because it ignores the enormous weight of patristic and Magisterial support for the historical truth of all of the events related in Genesis 1-11 and gives the impression that Bible scholars can interpret Genesis without regard to the Fathers, Sacred Tradition, and authoritative Magisterial teaching. In so doing, Fr. Guinan out-Protestantizes the Protestant creationists who are actually much closer to the Fathers in their interpretation of Genesis 1-11 than Fr. Guinan! Fr. Guinan goes on to say that the Old Testament chronology “suggests” that the Earth is only thousands, not millions of years old. But Fr. Guinan fails to point out that the Old Testament writers were not the only ones to affirm this. All the Fathers agreed on this point in opposition to the Graeco-Roman intellectual elite of the patristic period who believed in long cycles and great ages of time. A soon-to-be published study of the firmiter dogmatic statement on creation of Lateran IV proves conclusively that for more than 600 years virtually all of the authoritative Catholic commentators on Lateran IV held that “all things” were created ex nihilo either mediately or immediately in a very short creation period and that this consensus was only challenged by the advent of Lyellian geology. Fr. Guinan asserts that modern geology has “shown” that the time frame upheld by all of the Fathers of the Church “is not accurate.”But this is simply not true. Fr. Guinan fails to acknowledge that geology has progressed since the days of Charles Lyell. Evidence prior to historical times is un-falsifiable scientifically, whether origins be assigned to evolution by Darwin or by creation. No current experiment can verify the unknown conditions prior to human records. The geological assumption of gradual change in sediment deposits has been upset by recent experiments in dynamic creation of strata proving that multiple layers of sediment can be formed from fast-flowing currents. Moreover, as M.I.T. Ph.D. Dr. Walt Brown has observed, the supposed “proofs” for a great age of the earth are based on unreasonable assumptions. First, at Sunday Mass we recite the Creed, which begins, “We believe in God, the Father almighty, Maker of heaven and earth.” We believe! This is a statement of faith. God, the Father, has created all things in, through and for the Son, Jesus Christ. This affirms our deepest religious belief about all creation, and it is not subject to scientific proof or disproof. Religious language, though it may be the deepest and most true, is not the only way to talk about the wonders of creation. Clearly, science is another. It has its own methods and procedures, and, as science, does not and cannot deal with issues of ultimate concern. This has been recognized down through the centuries, e.g., by St. Augustine (d. 430), St. Thomas Aquinas (d. 1274), Pope Leo XIII (Providentissimus Deus, 1893), Pope John Paul II (Address to the Pontifical Academy of Sciences, Oct. 3, 1981), and Pope Benedict XVI (Speech to seminarians, Castel Gandalfo, July 25, 2007). Fr. Guinan’s list of citations is revealing. He cites two doctors of the Church and a Pope who upheld authoritatively the traditional literal historical interpretation of Genesis in regard to the creation of Adam and Eve and all the facts related in Genesis 1-11. In a papal encyclical Pope Leo XIII (Arcanum, 1888) authoritatively upheld the special creation of Adam and the literal creation of Eve from Adam’s side on the sixth day of creation. Pope John Paul II and Pope Benedict XVI made their remarks favorable to evolution in non-authoritative settings and, in both cases, without defining what they meant by evolution! Fr. Guinan gives the impression that Leo XIII’s teaching on creation was delivered with the same degree of authority as the cited speeches of the last two popes. While this is typical of the New York Times, it is inexcusable in a Catholic scholar—to place an infallible teaching of the ordinary Magisterium on the same level as two vague and non-authoritative papal statements. Not surprisingly, Fr. Guinan ends his conclusion by reiterating his rejection of Catholic metaphysics and the patristic understanding of the difference between the order of creation and the order of providence. Finally, new scientific discoveries may challenge us to deepen our understanding of a biblical text or of a theological position. We believe, however, in the deepest sense, that there can be no ultimate contradiction. The Source of Truth is One, and that Source is God, the Father of Jesus Christ, in, through and for whom all things are created. With this statement, Fr. Guinan shows that he has indeed embraced the very deception that St. Peter warned against in 2 Peter 3—that things have always been the same from the creation of the world and that natural scientists can therefore deepen our understanding of the original work of creation. In the light of traditional Catholic theology and philosophy, new scientific discoveries cannot deepen our understanding of something that belongs to a metaphysically distinct order of things. New scientific discoveries cannot tell us any more about how Jesus changed water into wine or made blind eyes see. And neither can they tell us how God made the heavens and the earth and all they contain in the beginning. Natural scientists can tell us more about the structure and operation of nature in the order of Providence, but only Divine Revelation can tell us how things were created in the beginning. It is time that theologians put evolution-minded natural scientists in their place and restored the Word of God as proclaimed by the Magisterium and by all of the Fathers to its rightful position. Only then will they stop shepherding their sheep out of the sheepfold of God’s Truth and into the mouths of wolves in white lab coats. Dr. Dean Kenyon holds a Ph.D. in biophysics from Stanford University.He is the author of Biochemical Predestination, a widely-read book on the origins of life which advocated a theory of natural chemical evolution. He is Emeritus Professor of Biology at San Francisco State University. Hugh Owen is a writer and editor and the director of the Kolbe Center in Mt. Jackson, Virginia. The Kolbe Center provides a forum for Catholic theologians, philosophers, and natural scientists who believe that the traditional Catholic doctrine of creation gives a better explanation of the facts of Scripture, Tradition, and natural science than theistic evolution. Fr. Michael D. Guinan, “Creationism: What’s a Catholic to do?”http://www.americancatholic.org/Newsletters/CU/ac1007.asp Fr. Guinan, a Franciscan priest, is a professor of Old Testament, Semitic languages and biblical spirituality at the Franciscan School of Theology in Berkeley, California. Quoted in W.R. Bird, The Origin of Species Revisited, Volume II (Nashville: Regency, 1991) p. 2. Protestant creationism interprets Genesis 1-11 without regard to Sacred Tradition or Magisterial teaching.The traditional Catholic doctrine of creation carefully distinguishes between the creation period when God supernaturally created the original universe and the different kinds of creatures and the period of providence which began after the creation period was completed. The traditional Catholic interpretation of Genesis upholds the historical truth of the post-creation events related in Genesis 1-11, in the light of the unanimous interpretation of the Fathers and the authoritative teaching of the Magisterium. Cf. John C. Sanford, Genetic Entropy and the Mystery of the Genome (New York: Lima, 2005). Percival Davis and Dean H. Kenyon, Of Pandas and People, second edition (Dallas, TX: Haughton Publishing Company, 1992). Jonathan Wells and Paul Nelson, “Homology: a concept in crisis,” Origins and Design 18(2):12–19, 1997. Gertrude Himmelfarb, Darwin and the Darwinian Revolution (London: Chatto Windus, 1959), p.320. Dominique Tassot, et al., Creation and Time (Abakaliki, Nigeria: Diocese of Abakaliki, 2007); revised internet version at www.catholicorigins.com . Geological Dating Principles Questioned, Journal of Geodesy and Geodynamics: Vol. 22, No 3, 2002, pp. 19-26 Aug 2002. Analysis of Main Principles of Stratigraphy on the Basis of Experimental Data, Lithology and mineral Resources:Vol. 37, No 5, 2002, pp. 509-515 Oct 2002. Sedimentological Interpretation of the Tonto Group Stratigraphy (Grand Canyon Colorado River), Lithology and Mineral Resources, Vol. 39, No 5. Oct 2004. “To estimate a date prior to the beginning of written records, one must assume the dating clock has operated at a known rate, the clock’s initial setting is known, and the clock has not been disturbed. These three assumptions are almost always unstated, overlooked, or invalid.” Walt Brown, In the Beginning, seventh edition (Phoenix,AZ: Center for Scientific Creation, 2001), p. 28.